Portuguese interior decorator Marina Saldanha transformed this former fisherman’s hut into a beautiful vacation home. Situated on the Atlantic coast in Alentejo, Portugal, the house has a peaceful cactus garden. The interior of the house is charming with its simplicity. 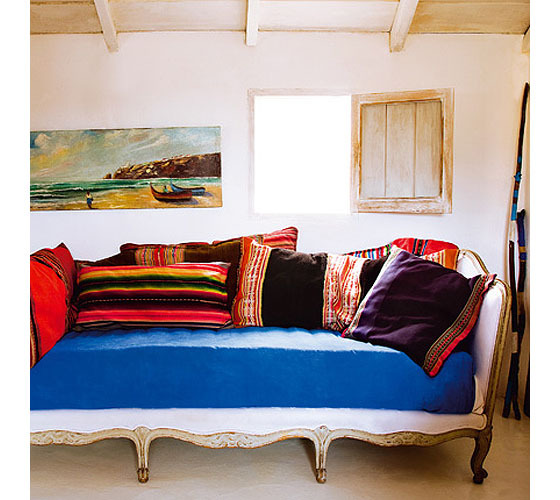 White walls are complemented by colourful cushions and bed linen. The colourful accessories in the kitchen brighten the room. The rustic beauty of the house creates a perfect atmosphere for relaxation.